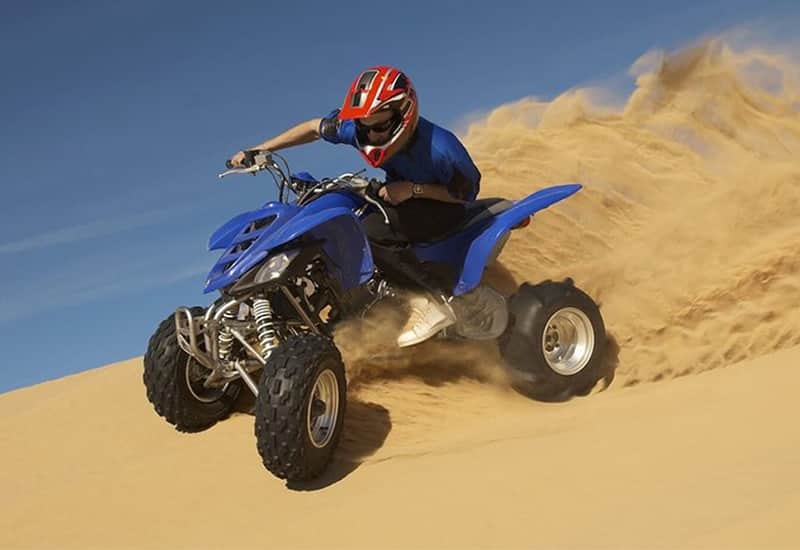 Enjoy the Quad bike experience and ride through the ever-changing dunes of sand. You can enjoy the quad within the track or outside the track as well you will be having the unforgettable experience during your drive in the desert sand and our professional staff will be there to guide you and help you out during your drive. It is one of the best Dubai tours that one can try during his business or family and friends holidays. Every moment of this excursion is filled with fun and enjoy. No matter which package you choose, the Desert Safari Dubai deal includes pick and drop facility, refreshment, a ride on the 4WD vehicle; sunset view of the desert, some fun activities, camp visit, etc. 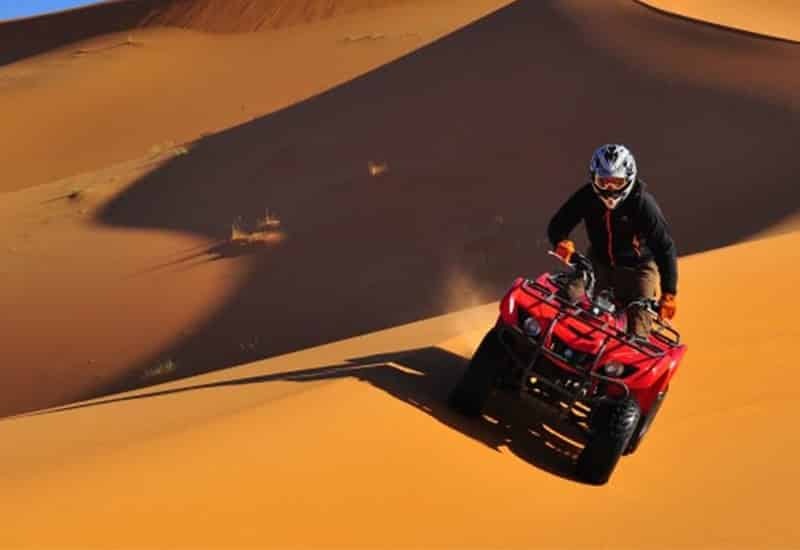 Different tour desert safari operators offer varied activities, some offer dune bashing/camel riding while others give you a chance to have fun with the quad bike ride, henna tattoos, music in desert, sand boarding, etc. Also you check another below options for quad bike and make inquiry. Quad bike, Never miss it! Recommended to do. Skyland team are just professional and provide good quality of service. Great tour!! A quad bike is an all-terrain vehicle with three or four wheels. 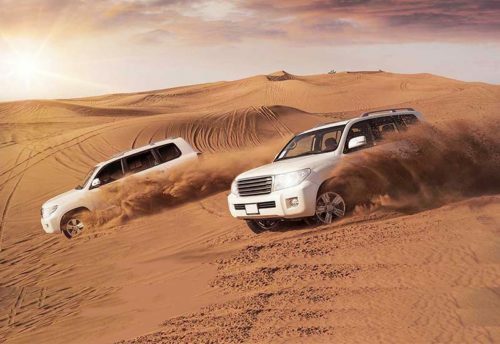 The vehicle uses low-pressure tires designed to handle a wide variety of terrain including loose desert sands. A quad bike has a seat that is straddled by the operator and handlebars used for steering. The rider sits and operates the bike as a motorcycle. Quad biking Dubai is the best desert adventure that you can experience in Dubai. 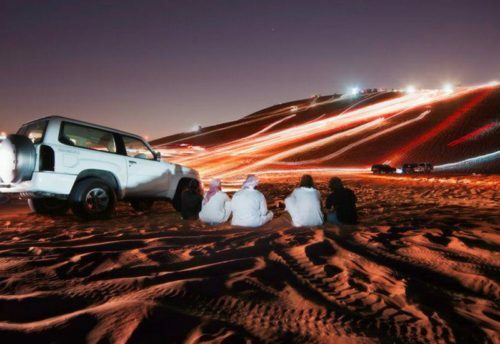 Among Dubai’s most famous desert destinations is the ‘Big Red’ sand dune which rises up to 300 feet high. You can visit this sand dune among other desert sites for a delightful desert tour. Along with a quad biking experience, you can also go on a camel ride and later enjoy an excellent buffet dinner at a Bedouin desert camp. Why go for the Quad Biking Dubai tour? This tour will let you explore Dubai’s Desert landscape through undesignated routes where you will get to witness the lovely desert scenery. Getting to ride a quad bike ride is a unique experience. It’s your chance to ride a 450 cc Quad bike through the desert landscape. This quad biking Dubai tour is perfect for those traveling in groups. It is therefore ideal for a fun tour with friends and family. 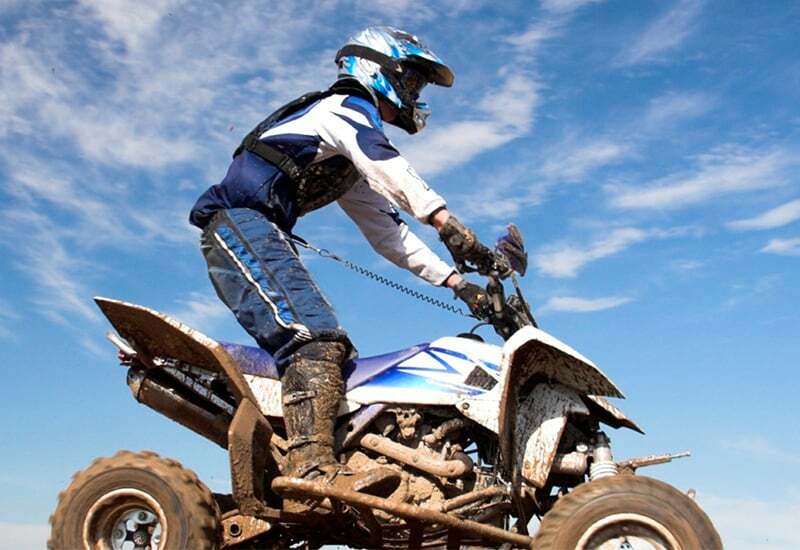 Quad biking is an exemplary desert activity for motorsports enthusiasts. A quad bike is an exceptional vehicle and riding it through the desert will be a really exciting experience. 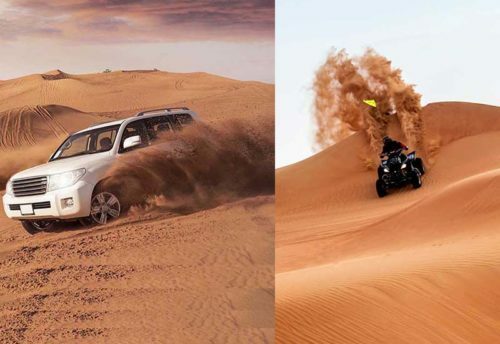 The off-road desert tour will be a chance to capture amazing images of Dubai’s desert scenery. These will be a great addition to your traveling portfolio. The visit to the Bedouin-style desert camp is a chance to experience the Arabic hospitality and culture. With Quad biking Dubai, you will get to see Dubai’s desert scenery in a special way. You can book a quad biking session with Skyland tourism and get to take this thrilling adventure. Appreciate the Quad bicycle understanding and ride through the consistently changing ridges of sand. 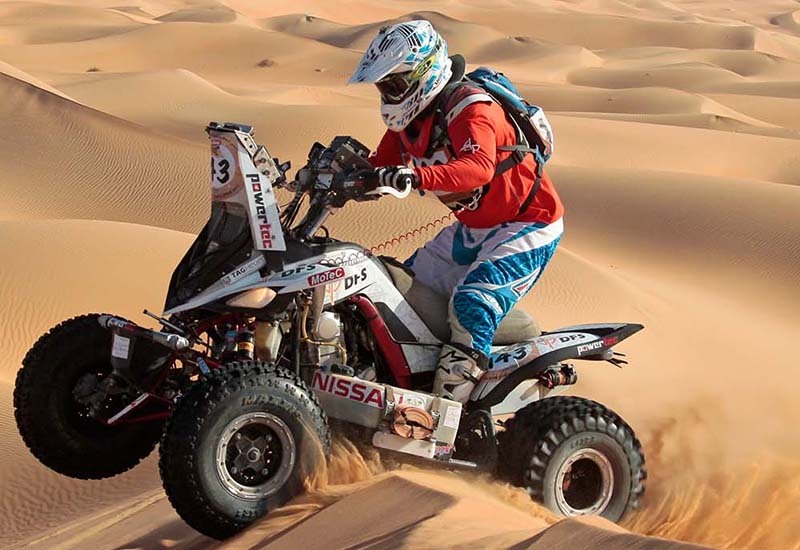 You can appreciate the quad inside the track or outside the track too you will have the remarkable experience amid your drive in the desert sand and our expert staff will be there to manage you and help you out amid your drive. It is outstanding amongst other Dubai visits that one can take a stab at amid his business or family and companions occasions. Each snapshot of this trip is loaded up with fun and appreciate. Regardless of which bundle you pick, the Desert Safari Dubai bargain incorporates pick and drop office, refreshment, a ride on the 4WD vehicle; sunset perspective of the desert, some fun exercises, camp visit, and so forth. Distinctive visit desert safari administrators offer changed exercises, some offer rise slamming/camel riding while others allow you to play around with quad bicycle ride, henna tattoos, music in desert, sand boarding, and so on. A quad bicycle is an off-road vehicle with three or four wheels. The vehicle utilizes low weight tires intended to deal with a wide assortment of territory including free desert sands. A quad bicycle takes a load off that is straddled by the administrator and handlebars utilized for guiding. The rider sits and works the bicycle like a cruiser. Quad biking Dubai is the best desert experience that you can involvement in Dubai. Among Dubai’s most celebrated desert goals is the ‘Enormous Red’ sandhill which ascends to 300 feet high. You can visit this sandhill among other desert locales for a superb desert visit. Alongside a quad biking background, you can likewise go on a camel ride and later appreciate a magnificent smorgasbord supper at a Bedouin desert camp. Skyland Tourism offers two quad biking Dubai bundles. Quad biking Dubai is an extraordinary method to investigate Dubai’s desert scene. Here are a few reasons why you should go to this fun experience. This visit will give you a chance to investigate Dubai’s Desert scene through undesignated courses where you will get the opportunity to observe the beautiful desert view. Getting the chance to ride a quad bicycle ride is one of a kind affair. It’s your opportunity to ride a 450 cc Quad bicycle through the desert scene. This quad biking Dubai visit is ideal for those going in gatherings. It is along these lines perfect for a fun visit with loved ones. Quad biking is a praiseworthy desert action for engine sports lovers. A quad bicycle is a remarkable vehicle and riding it through the desert will be an extremely energizing background. The rough terrain desert visit will be an opportunity to catch astonishing pictures of Dubai’s desert landscape. These will be an extraordinary expansion to your voyaging portfolio. The visit to the Bedouin-style desert camp is an opportunity to encounter the Arabic neighborliness and culture. With Quad biking Dubai, you will get the chance to see Dubai’s desert landscape uniquely. You can book a quad biking session with Skyland the travel industry and get the opportunity to take this exciting experience.